Does the V136C have the swing down RF chassis like the V114? Immediately post-war Murphys seem to be almost as rare as pre-war televisions. I've never seen one of those, in fact I didn't know Murphy made TV's before the war. You have certainly done a brilliant job on it. The CRM91 seems quite a modern tube for a pre war set, they were still using them in the '50's and they weren't a lot of good then, at least the 12" one wasn't, we had many fail under guarantee, but yours looks fine. We scrapped a number of pre war TV's in the '50s - I wish I had them now! Murphy made two generations of pre-war televisions. The A42V in 1937, and the A56V/A58V in 1938 (the A58V was just an A56V with a radio, essentially the same set). According to some information on the internet, Murphy had been doing television experiments before the start of television in November 1936. But for whatever reasons they were not ready with a television for the start in November 1936. For all intents the A42V when it was introduced in 1937 was "late to the party", it was a mirror lid television when the likes of EMI were introducing direct view televisions (i.e. no mirror). If the quoted sales figures are reliable they only sold 62 sets. It probably didn't help that the A42V was probably over-engineered and too costly for the target market, who were more interested in price. The A56V and A58V introduced in 1938 seems to be a sea-change in attitude, they obviously realised cost was the primary stumbling block for sales. The A56V had a 9" CRT tube for the amazingly low cost of £30, when the EMI competition could only offer a tiny 5" tube for 30 guineas (i.e. £31 10 shillings). It is probably quite evident Murphy were subsidising the cost of the A56V to gain market share. 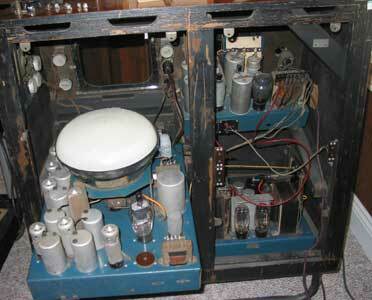 The A58V with radio sold for £45 which was comparable to say a HMV 907 at 45 guineas (i.e. £47 5 shillings). So Murphy were probably not making a loss on the A58V. The A56V according to the quoted sales figures sold reasonably well at 1445 sets. The A58V sold rather less well at 225 sets. Perhaps due to having no cost incentive people choose to go with the market leader (EMI with their HMV and Marconiphone brands) when it came to the A58V. As far as survivability is concerned, oddly about 7 sets survive for each of the A42V, A58V and A56V models, making a total of about 21 sets. Which both means Murphy televisions survived in very low quantities, and that the A56V survived in vastly lower quantities percentage-wise than the other models. One can only speculate why so few Murphy televisions survived. Here first you have to consider the survival rate among all pre-war television manufacturers. One thing which is clear is table models are over-represented in respect to the larger console models, presumably because table models sold more and were easier to store after they ceased to be usable. None of the pre-war Murphy televisions were table models, and hence suffered a higher rate of destruction, which exacerbated their low sales in respect to other manufacturers. But there is another thing in play here, the really expensive televisions survive in greater ratio than cheaper sets, presumably because they cost so much, despite being bulky. So as usual there's a certain squaring of the circle here. The expensive sets survive because they were expensive. The cheapest sets survive because they were table models and easy to store. Perhaps the A42V and A58V survive in high quantities percentage-wise because they were expensive. The A56V survives in vastly less quantities percentage-wise perhaps because it was neither expensive nor easily storable being a console. My good CRM92 tube is a result of buying as many post-war TVs with a CRM92 as I could find. That way I have obtained 4 CRM92s, by luck one of them turned out to still have a good emission tube. With the other 3 I obtained two fairly useless low emission tubes, and a reasonable emission tube, it shows signs of lower emission but it still works reasonably well. I had that tube in the V56V for most of the restoration work, swapping it out for the better emission tube for the video and the picture of the test card. I have read that many dealers in the 50s deliberately scrapped pre-war televisions because of the dangerous mains derived EHT power supplies. They didn't want them to fall into the wrong hands. Call it in hindsight the wrong move but it was done then for the best of reasons. I should add they made a 3rd generation, which they advertised at Radio Olympia in September 1939, but none of those were sold due to the close down of television later that month due to the out break of war. AFAIK only one of those is known to survive which was presumably a pre-production model. Great write-up. Thanks for posting. I have now got my HMV 900 out of storage and I can now give you the model numbers. Sod's law means I had already packed it away when you asked for the model numbers. I didn't expect it to be over three years before I got chance to look at it again (my excuse is I only have space to have one set under restoration at any one time). I have begun a preliminary check of the chassis and compared it against the descriptions elsewhere. Is anyone keeping tabs on the extent of Baird circuity present in these first generation sets? I see there's recording of whether the Baird valve is top-blanked or bottom blanked, but there appears to be quite a few differences between top blanked sets. Some have the socket top blanked and nothing left whatsoever of the other circuitry. Some have more than that. I saw one thread with photographs that showed it had almost the complete Baird circuitry surviving bar the standards switch. Further reading suggests the difference is often between EMI modified sets and dealer modified sets. EMI did the complete overhaul whereas dealers often did no more than necessary, remove the switch, blank the socket. Is that your understanding of the situation? Does anyone care about this? This HMV 900 seems to have more Baird circuitry present than anything else I have seen. From what I can tell it is complete bar the standards switch. I'm not sure about the extent of Baird circuitry remaining in sets with top blanking. I certainly think it's worth being able to display 240 lines 25 Hz. Finding a standards switch that can fit in the limited space of the original is the only difficult part. My set never had the Baird circuitry and I had intended to fit the Baird valve on a small piggyback chassis but as it happens the graphics card signal generation gives me line pulses during the frame sync so I only needed to incorporate the switchable timing components and I mounted my standards switch on the bracket of the push about centring pot rather than risk damaging my plastic switch cover. p.s. Your Murphy picture is very impressive and devoid of any trace of ion burn. Last edited by peter_scott; 11th Dec 2018 at 10:26 am. Location: Henley on Thames, Oxfordshire, UK. Correct me if I'm wrong but did Murphy in 1939 produce the V84 table set and V84C console version with a CRM92, V86 with a CRM121 and the tall V88C with radio. With the onset of war the numbers produced were perhaps very low and may have not sold. No known sets have survived. You are correct that Murphy produced the V84, V84C, V86C and V88C in 1939. There were certainly only a few of each set made for the initial showing at Radiolympia. However they were never actually available for sale due to the shutdown of the television service before factory production started. The only known Murphy 1939 TV to survive is my V84 table model. That one escaped destruction for spare parts in the war due to being sold to an employee who kept it. I suspect if it had been in production and on general sale, it would not have sold well as it is just plain ugly! The BVWS Bulletin often asks for articles etc. I'm thinking this restoration might be worth writing an article on it for the Bulletin? I have not yet decided. One thing I don't know about is are there any conflicts with writing about the restoration here on the forum, if I may want to write a Bulletin article later? This question is perhaps more directed to the BVWS committee members or anyone with experience of writing Bulletin articles, but, of course everyone is welcome to advise. According to the book "The Best of Murphy Cabinet Design 1930 to 1950" (see footnote) which you no doubt have seen, it was designed by R. D. Russell, who designed both the A56V and the A58V, and so it is odd to get such a rather plain looking TV, not a Murphy design best IMHO. Dare I say it looks more like a plain Cossor or Ekco of the same year. But surely the prize for the most weird goes to the V88C on page 59! It's one you either love or loathe on first sight. (footnote) You're going to have to Google for the book, every time I try to paste the URL in, the interface mangles it with asterisks for completely unknown reasons. My set never had the Baird circuitry and I had intended to fit the Baird valve on a small piggyback chassis but as it happens the graphics card signal generation gives me line pulses during the frame sync so I only needed to incorporate the switchable timing components and I mounted my standards switch on the bracket of the push about centring pot rather than risk damaging my plastic switch cover.. Yes, I have seen your article about getting Baird 240 line TV working on your set. Very interesting. I wondered how you got line sync without the Baird valve, all is now explained. Stephen, many thanks for the link. Very impressive Catkins. I didn't know that Murphy produced a Pre-War TV either. Apart from anything else, you've obviously saved a very rare item. More info/photos would be very welcome. As for the striking blue colour, I think I might be right in saying that some Murphy radio sets have a blue chassis but perhaps a slightly lighter shade. It looks great anyway! Yes, I think you are right. Late 30s sets were painted blue, immediately post-war sets were painted grey. As far as what shade of blue this set was painted, it was actually rather difficult to tell, because there were a number of different shades present, perhaps due to different rates of preservation. I looked at the photos on the internet of rather better preserved A58Vs (i.e. http://www.earlytelevision.org/image...58v_back-2.jpg) as an additional guide, but photos can be unreliable. The exact shade in the photo often depends on lighting, whether flash is used etc. After some experiment, I chose to use Hammerite Blue to respray, this gave a reasonable colour match to the existing paint-work and had good properties such as hardness, resistance to damp penetration, and long-life which a lot of other paints don't have (such as car respray paint). I think the colour match is decent, but it is probably a little less "green" than the original paint-work. Attached are two photographs. The first is a photo of the unrestored chassis but also with the painted metal plate on which the occasional controls are mounted. This was screwed to the cabinet, and hence not exposed. There also a couple of better preserved pieces of paint-work visible on the chassis, especially where components have been removed. The second photograph is a composite of that photo and the repainted chassis. I think the colour is a reasonable match. Great write up and what an epic journey! The CRM91 pre war tube is an odd one and was certainly 'wide angle' at 64 degrees, compared with it's post war replacement the CRM92 57 degrees listed as a replacement for the CRM91. It is a short stubby tube and considerable difficulties could be experienced attempting to squeeze the 92 into a 91 chassis. Mazda gave very little information stating only that the bulbs physical dimensions differed from the original.. Thanks HCS for the nice comments. I noticed that Mazda gave very little information about the physical dimension differences, and how to accommodate them Luckily, I did have the broken CRM91 to take measurements and compare against a CRM92, plus I obviously could put a CRM92 in and measure the differences (i.e. discover what is different and why it is different). It doesn't only differ in length, but also in breadth along the length, and given the circular hole in the CRT mount was designed for the CRM91 breadth, it ends up sticking out above the mount by about 10mm too much and sticking out below the CRT mount by about a bit too. Which means it hasn't enough clearance when the chassis is swung into the "presentation mode" as it hits the glass. Obviously fixing the 10mm sticking out there impacts on the deflection/focus coil mounts as the 10mm has to go somewhere. I spent some time working out how to accommodate the extra differences, as I wanted to do this in a completely non-destructive way, without modifying any of the existing parts. Also if I ever do get a CRM91, it is important to be able to put it back to the original. I'll cover the work I did at the appropriate place, as I want to keep things in chronological order. Great restore and write up, please post some more info and pictures on the stages you went through if you have them. I took probably hundreds of photos over the restoration, both as a record, and as an aid to putting things back together exactly as they originally were. My idea of a good restoration is you've fixed things but altered nothing, so it might simply be a well preserved set . Now that I have replied to most of the comments, I can start adding more posts about the restoration. Good choice with the paint. A very good paint here in Australia is VHT (High temperature spray paint) it was designed for very hot running automotive parts and comes in a number of colours. It is rated to 550F or 288 DegC. The good thing is that its also easy to bake in a home oven and it adheres well, and is extremely scratch resistant and like many high Temperature products , doesn't seem to age at room temperature. I used grey for my Argus chassis, and to improve the adherence, since in this case the chassis was aluminium, I treated it with Bondrite which is an aviation aluminium primer (see photo). The other way I get good looking and long lasting finishes in my restorations is with powder coating. But in these cases, you have to trust your parts to a powder coating factory. However, it gives a good black with just a trace of gloss and is extremely scratch resistant, won't flake off and out of sunlight lasts many decades. The brackets were re-electroplated prior to powder coat (see photo). Notice the EHT cage which has a custom dark bronze metallic powder coat to replicate the original finish. Its a long time since I have seen the 'Argus' I have a practical Television on it somewhere. Those EF50's look very smart and enhanced by the octal valves in matching red! Very neat job. Thank-you for your comment. I was worried people might criticize it as a too easy "off the shelf commercial paint". I will happily admit I am a complete tyro when it comes to paint, because this is the first chassis I ever had to re-paint. I took advice from my brother who also collects classic cars, and has used a wide variety of different paint preparations over the years. You are very knowledgeable about paint preparations, and your results are very impressive. According to relatives in the motor trade, it is only the primer and undercoat of car paints that provide protection. The top coat just provides the colour. I was worried people might criticize it as a too easy "off the shelf commercial paint". I will happily admit I am a complete tyro when it comes to paint, because this is the first chassis I ever had to re-paint. That is even more impressive, your first one, again great job and no doubt there will be more to follow.